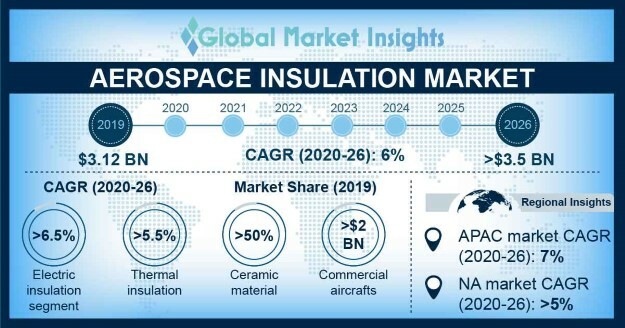 Aerospace Insulation Market size is estimated to surpass USD 5 billion by 2024; according to a new research report by Global Market Insights, Inc. Rising demand for air traffic across the globe along with stringent government regulations pertaining to materials used in aircraft insulation with enhanced properties are driving the industry growth during the forecast period. Introduction of advanced materials such as aerogels and spider silk with enhanced hybrid properties will positively influence the industry share over the study timeframe. The increasing focus on lightweight aircrafts in the commercial and military sector is boosting the aerospace insulation industry. Industry participants are increasingly investing in research activities for introducing light weight and cost competitive alternatives with high recyclable content and modular functionalities which will further strengthen the industry revenue over the forecast time span. Electric aerospace insulation market share is expected to witness the highest CAGR at over 11% from 2018 to 2024. This growth can be credited to the increasing number of electrical components in aircrafts. Thus, the requirement of efficient temperature management for preventing overheating and short circuiting will support the segment dominance over the next six years. The introduction of low cost carriers accompanied with improving living standards in emerging nations are inducing growth in air travel. This has resulted in increased aircraft production and deliveries. Aircraft manufacturers are ramping up production activities to meet previous backlogs, further fueling the aerospace insulation market share till 2024. Regulatory authorities across the globe including Federal Aviation Administration (FAA) and European Aviation Safety Agency (EASA) are amending multiple standards and procedures for increasing the flights safety. For instance, EASA has mandated the retrofitting of enhanced fire resistant and thermal & acoustic insulation panels for in-service aircrafts boosting the business revenue. However, the absence of proper recycling technology for insulation materials coupled with high labor cost may hamper the aerospace insulation market size during the study time frame. The ceramic material in aerospace insulation industry will capture the maximum revenue share of around 52% by 2024. The segment dominance can be attributed to the exceptional properties such as enhanced chemical inertness, tensile strength, and high melting temperatures. The increasing adoption from commercial and military sector is escalating the business size over the study timeframe. The aerospace insulation market share from commercial aircrafts will exhibit maximum volume share of over 180 kilo tons by 2024. Rising domestic and international air traffic globally owing to affordable fares coupled with increased aircraft production will provide a positive outlook for the industry over the forecast time frame. The airframe segment is predicted to generate over USD 3 billion by 2024. The increasing innovations to reduce weight of aircrafts by using advanced composites is driving the segment revenue. The need for enhanced fire resistant, acoustic, and thermal insulation for increasing passenger safety and comfort are supporting the aerospace insulation market share over the study time frame. The fixed wing segment generated more than USD 2 billion in 2017 owing to increasing usage of materials for thermal & acoustic insulation purposes, ancillary ground support equipment, and cabin interior will augment the segment size. The proliferating deployment of aircraft weather protection covers will accelerate product dominance over the forecast time span. North America is set to capture maximum industry volume share of around 40% over the projected time line. Increasing aircraft production and deliveries owing to rising air traffic and the presence of multiple industry players in the U.S. are expanding the regional aerospace insulation market share till 2024. 3M, Hutchinson, BASF SE, DuPont, and Zodiac Aerospace are among the prominent players in the aerospace insulation market place. Other notable players include Esterline Technologies Corporation, Johns Manville, Evonik Industries, and Polymer Technologies Inc. Industry participants are mainly focusing on mergers and acquisitions to enhance their industry share. For instance, in November 2017, Evonik company acquired 3M’s high-concentrates additive compounding business. The acquisition enabled the company to expand its product portfolio in the solid additives business.